England's mauling by India in the fourth one-day international at Edgbaston should be a watershed moment for the team. When things get to the stage where performances and results appear inevitable, you know there is a serious problem and that problem has to be sorted out. This should not detract from India - they are one of the best one-day teams around at the moment and have shown England the standard you have to attain to have any chance of winning the World Cup. But the gulf between the sides is an absolute chasm at the moment and England need to have a root-and-branch review of their plans for the World Cup. 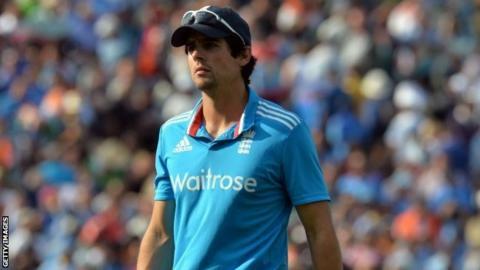 Alastair Cook's position as captain should be high on the agenda. The selectors must accept that there is a very strong argument for standing him down from the one-day team. I fully supported Cook's decision to remain as Test captain throughout the trials and tribulations of the summer. He is one of the finest Test batsmen that England have produced and has won some big series as captain. But Cook the one-day cricketer does not come with the same pedigree as Cook the Test cricketer - and that is why the argument is a different one. I want to see Cook winning back the Ashes as captain next summer. My worry is that by continuing down this line, leading what is almost certainly going to be an unsuccessful World Cup campaign, and with absolutely no break at all between January and next August, he will simply be exhausted by the time he turns his mind to regaining the urn. Call me traditional, but Test cricket is the most important thing. Look at the odds of England winning the World Cup and they are very low. They would have to improve their game by a phenomenal amount. Cook and the selectors need to get together and look at whether continuing with him as captain is the best way forward for England to win the Ashes next summer. If there is any doubt at all in their minds, they should agree to give Cook a break before bringing him back in the West Indies in April to begin the Ashes build-up. I know Cook is incredibly resilient and determined, but I also know what a massively challenging Test summer he had personally. You have to wonder whether it is in his interests to really push himself to prove himself in the one-day arena. "I think we're playing a form of one-day cricket that was played in the mid-1990s. We are going absolutely nowhere. We have got the personnel but they are either not allowed to play attacking cricket or they are afraid to play that way. We are not putting the opposition on the back foot enough either with bat or ball. To me it's too easy to play against England." Cook is not the only England batsman whose game looks outmoded in the modern era of one-day cricket. As a unit, the England team looks very old-fashioned and reserved. I have always said that if you showed me any batsman at the crease, without revealing his face or team colours, I would be able to tell you within an over which country he played for. An English batsman would probably leave the ball two or three times an over and play with a nice straight bat. That is how we are in life, compared with the more flamboyant and expressive Indians, Sri Lankans or West Indians. It will therefore always be difficult for England to win a one-day World Cup, but they would certainly stand more chance if they gave greater thought to the type of tactics and personnel who would make them successful. The most important thing is that you assert yourself over the bowlers. You have to make them terrified of bowling to you, just as India openers Ajinkya Rahane and Shikhar Dhawan did on Tuesday. I'm not calling for a team of seven sloggers and four bowlers. You need to have a mix, but you do have to have players capable of taking an attack apart. Alex Hales and Jos Buttler have shown they have the potential to do that and Eoin Morgan just needs to find some form, but elsewhere there should be changes. Gary Ballance may have failed at Edgbaston but I would like to see him given a run in the side because I think he has the mentality and range of shots to be a force in both Test and one-day cricket. Ian Bell has been around a long time. He is a lovely batsman to watch, but you wouldn't say his game has advanced. He is a one-day cricketer of five years ago. Another player who deserves a chance is Nottinghamshire's James Taylor, a proven technician with a fine domestic one-day record, while Moeen Ali showed at Edgbaston what he is capable of in one-day cricket with a counter-attacking 67 off 50 balls. It is largely a question of mindset, ensuring that the players who play one-day cricket for England are not stuck in a Test match mentality. Next up for England is a seven-match one-day series in Sri Lanka in November and December. On the face of it, it seems a good idea to prepare to the World Cup by playing lots of white-ball cricket, but the tour could turn out to be a complete disaster. The pitches in Sri Lanka are totally different to those in Australia, the team will require a different balance, and the Sri Lankans are excellent one-day cricketers. England could very easily get heavily beaten and turn up for the Tri-series in January with their confidence shot. The selectors will hope for a different outcome, of course, but they will not get one without a total rethink over the way this team is going. They just cannot carry on being beaten like this. Jonathan Agnew was speaking to BBC Sport's Sam Sheringham.